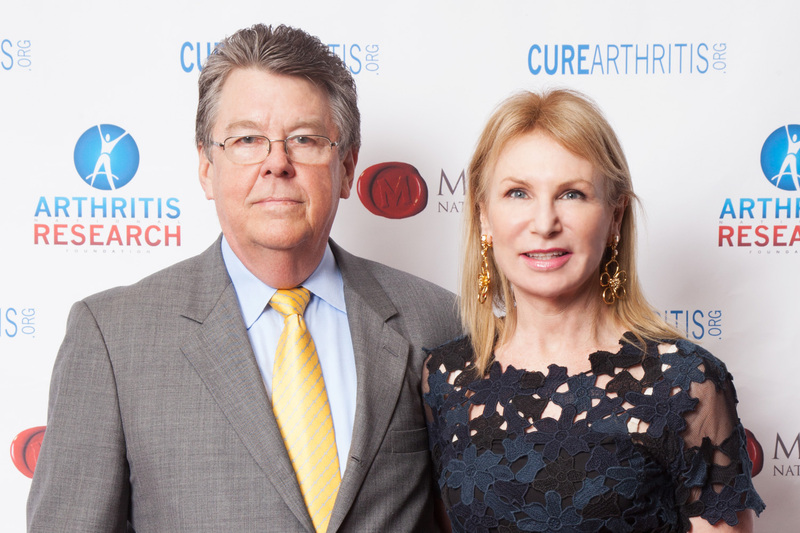 “ANRF believes that early research is vital to finding a cure for arthritis,” says Dr. Newton, who serves on the Foundation’s board as the Treasurer. “My wife Giulia and I are excited about the unique mission of ANRF. On a professional and personal level we have a deep connection to the organization. Our son was diagnosed with psoriatic arthritis in his mid-20s. After being diagnosed, he was initially put on an older drug that provided little benefit. He was then put on one of the newer ‘biologic’ drugs, which was effective in treating his condition, allowing him to resume his normal level of daily activity. Understanding firsthand what patients go through was eye-opening for us. Funding early-stage research is a critical need. Over the past 30 years, I have seen the pharmaceutical industry dramatically move away from funding early research. The competitive pressure in the industry now forces companies to focus on drugs that are either already in clinical development or have completed pre-clinical development. It is now estimated to cost $2.6 billion dollars to bring a drug from discovery to approval. Early-stage drugs take six to 10 years to reach clinical trial phase, and then less than 10% will survive to approval. So you can see why industry has moved away from funding very early research—they prefer later-stage drug candidates where the probability of actually having an approved drug will be much greater. In the current economic and political environment, funding is also very limited at the National Institutes of Health (NIH). Competition for funding is now so intense that the average age of NIH grant recipients has increased by as much as 10 years over the last decade. Just as is the case in industry, the NIH is prioritizing later-stage research funding conducted by more senior researchers where the risks are lower. This has serious implications for the earlier, more innovative projects, but also for the career prospects of young scientists who cannot get funding and abandon their research careers. Speculative research is falling by the wayside. That’s exactly what ANRF funds. The late “Morrie” Granger was one of the first grant recipients funded by ANRF. The work that Morrie undertook with the ANRF grant became a precursor to the TNF inhibitor drugs that are now the mainstay treatment for several autoimmune conditions. Had it not been for the funding provided by ANRF this “crazy” research might not have been conducted because it was generally shunned by his peers as being too risky. TNF inhibitors were one of the drugs that helped our son, so it is gratifying to now be involved with the organization that supported the research that led to this class of drugs four decades ago. My other ANRF connection is that when I was a child, my aunt’s hands were so disfigured by rheumatoid arthritis that she could barely use them. As a child, this was disturbing and to this day the image of her dysfunctional hands is still burned in my memory. To see a person in their 20s with such a debilitating disease is shocking and it reminds me every day that we need to constantly educate people that arthritis is not only a disease of the aging. It is sad to realize that with the treatments we have today her life could have been so much better. If large biopharmaceutical companies and the NIH are not funding early stage research, where will the future therapies come from? With autoimmune disease the body adapts and new drug mechanisms are necessary to maintain effectiveness and this is the battle we fight. As good as our treatments are today, they don’t work for a lifetime. Also, people don’t appreciate that there are close to 100 conditions under the umbrella of arthritis, so a drug that is effective in one condition may be less effective in others. At ANRF, we are dedicated to finding the treatments of tomorrow, and more importantly, a cure for these terrible conditions that affect a quarter of the population. With the support of our generous donors we will continue to fund the brightest and most innovative young scientists because that’s what’s going to make a difference. Make a difference and have an impact by making a donation today! Dr. Schalon Newton brings to the Arthritis National Research Foundation (ANRF) Board more than 30 years of experience in the biopharmaceutical and medical device industry. He is currently the Chief Business Officer for Trefoil Therapeutics, an early stage biopharmaceutical company. During his career he has held senior positions in finance, sales and marketing, business development and corporate strategy in the U.S., Europe and Asian markets. Dr. Newton holds a B.S. degree in Business Administration from California State University, Northridge, an M.B.A. from the University of California at Berkeley, and a doctorate in management from Case Western Reserve University. Dr. Newton was recently elected treasurer of ANRF. In that capacity, he ensures that the highest fiduciary standards and full financial transparency are implemented at the Foundation.